with their complete drum sets making setup and teardown much easier. to an autographed guitar and a variety of additional merchandise. “A Moment of Thunder” is a production of Support America’s Armed Forces, a committee of the Pierce Military and Business Alliance (PMBA) – itself an association of local businesses and organizations that works to support local military members and their families. The event plan calls for local motorcyclists to gather at sites ranging from Tacoma to Tukwila and Renton, Lynwood and Arlington, start their engines at exactly 1 p.m., and “rev” those engines for a full 60 seconds. Proceeds from that “moment” will benefit the Fort Lewis Fisher House Foundation, the “home-away-from-home” organization that allows military family members to be near their hospitalized loved ones. So why has the event already grown to include so many more locations than originally planned? One reason, Rogers explained, is because area motorcycle dealerships, once they heard about “A Moment of Thunder,” wanted to be a part of it. Each location event is being hosted by one of those dealerships. The local gathering, hosted by Destination Harley, is at Lakewood’s Fort Steilacoom State Park, from 10 a.m. to 2 p.m. The motorcycle will be sharing the facility with the Pierce County Hispanic Chamber of Commerce-sponsored Latino Festival 2007. “A Moment of Thunder” carries a $15 registration fee for participants, and includes a raffle. All riders and bikes are invited – street bikes, dirt bikes, quads and three-wheelers. For more information, visit www.amomentofthunder.com or a participating dealer. Puyallup ­ Members of the military community will enjoy the Spring Fair in Puyallup this year, especially if they take advantage of FREE gate admission on Military Appreciation Day, Friday, April 20, 2007. Free gate admission will be offered to all active, reserve and retired military and their dependents, and disabled veterans when they show valid military ID. This includes members of the following branches: Army, Navy, Air Force, Marine Corps, Coast Guard, National Guard. Radio station AM 570 KVI is the media sponsor of Military Appreciation Days, created in an effort to acknowledge service of the military and their families in the community. The Spring Fair, which started in 1990, is open from 3 p.m. 10 p.m. on Thursday, April 19; from 10 a.m. 10 p.m. on Friday and Saturday, April 20 and 21; and from 10 a.m. 7 p.m. on Sunday, April 22. There are a wide variety of family-oriented activities to enjoy. In addition to 400+ exhibits, rides, food and animals, popular Spring Fair attractions will include a bicycle stunt show, pig races, dog Frisbee show, and Mexican dancing horses. The Garden Show will feature celebrated garden experts Ciscoe Morris, Ed Hume, and more, plus local florists participating in a design contest. The Northwest Junior Livestock Show and Sale has been a part of the Spring Fair in Puyallup, and will be a foundation feature again in 2007. The enthusiasm of all grade levels for the annual Puyallup School District science fair means a return engagement of the event, ³Science Explorations 2007² featuring projects created by students. Annual favorites include the KidZone and Creative Kids Exhibit. Adult admission is $8, Students (6-18 years) $7, and five years old and under are free. Advance discount tickets with ride bracelet coupons are available at Pierce and South King County Fred Meyer stores, Safeway, Columbia Bank, The Commons at Federal Way and South Hill Mall. Parking in official parking lots is free. For further info, visit www.thefair.com or call the 24-hour hotline at (253) 841-5045. (Puyallup Fair release) – Members of the military community will receive FREE gate admission at Military Appreciation Days, held during the Puyallup Spring Fair on Friday, April 20, 2007; and at the Puyallup Fair on Mondays, Sept. 10 and 17, 2007. Free gate admission will be offered on Military Appreciation Days to all active, reserve and retired military and their dependents, and disabled veterans, when they show valid military ID. This includes members of the following branches: Army, Navy, Air Force, Marine Corps, Coast Guard, National Guard. The Puyallup Spring Fair, which started in 1990, is open from 3 p.m. – 10 p.m. on Thursday, April 19; from 10 a.m. – 10 p.m. on Friday and Saturday, April 20 and 21; and from 10 a.m. – 7 p.m. on Sunday, April 22. The Scandinavian Cultural Center at Pacific Lutheran University in Parkland hosts the movie "Through Hell and High Water" Sunday at 3 p.m. and 7 p.m. It's the love story of Nancy Eide, an 18-year old Norwegian girl living in Hammerfest and Archie Kelly, a British sailor who took part in one of World War II's greatest rescues. The documentary film has garned numerous rewards, and will be introduced by Nancy Kelly, the couple's daughter. For more information, call (253) 564-2832. 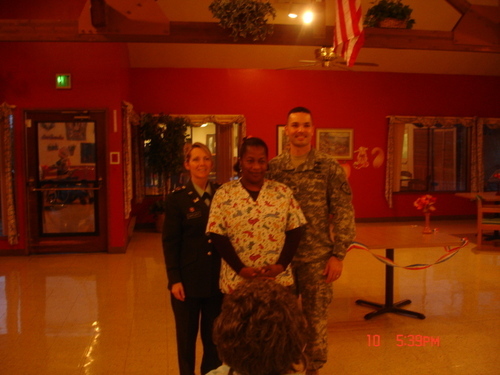 Members of the 84th ARTAC at Fort Lewis will help residents at the Park Rose Care Center by packing and shipping their gifts destined to loved ones outside the area. 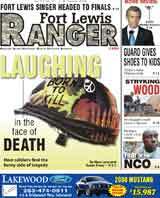 The Fort Lewis troops will be on hand December 9 from 1-4 p.m. at the center. Organized by Right At Home, a local in-home care company, the event is also supported by students from Foss High School. Chopstix Dueling Piano Bar (2702 6th Ave., in Tacoma) salutes the military November 24 & 25 with a evening of music and singing with NO Cover Charge to military personnel. Nice. The Rotary Club of Hawks Prairie unveils the "Military Family" statue this Saturday, 10 a.m. at the Home Depot-Costco parking lot - corner of Marvin Road & Quinault Drive. In the works for a couple years, the statue salutes the families who support this nation by supporting their military loved ones. Representing the local military will be Brigadier General William J Troy, deputy commanding general I Corps and Ft Lewis. Anglers suggest the mouths of the Puyallup and Nisqually rivers, plus off the tip of Point Defiance Park in Tacoma. Good luck.